The passing of Marcella Hazan last week has brought to my mind the many pasta sauces I first learned from her wonderful book Essentials of Classic Italian Cooking, such as tomatoes with butter & onion, sausage and cream, and olive oil, garlic, and parsley. The last, aglio e olio, is one of Rome’s classic sauces, and when I think of it I also think of Armanda al Pantheon, a rare gem of a restaurant only steps from the Pantheon, serving true, well-made Roman classics instead of the tourist junk so common in the center. Their pastas are understated but perfect. It’s one of the fastest sauces one can make, but its simplicity requires everything to be perfect: ingredients and execution. The best boxed pasta that is most available in this country is De Cecco, but even better is to take the time to order a really great one. My favorite is Garofalo from Naples. My favorite olive oil is Frantoia Barbera from Sicily. 1) Bring four quarts of water to a boil and add 2 tablespoons salt. Add 4 ounces pasta and cook until al dente. 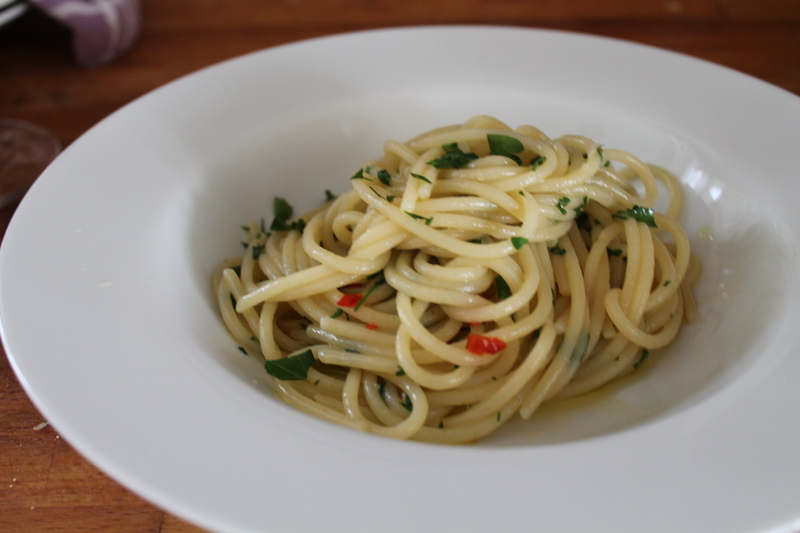 2) While the pasta is cooking, gently cook 1/2 teaspoon or so chopped garlic in a small pan with enough olive oil to later coat the pasta well. Add salt and some hot pepper to taste (preferably fresh).Cook until the garlic is aromatic and lightly colored but not browned and bitter. Remove the pan from heat. 3) When the pasta is ready, add just a touch of the pasta cooking water to the sauce, then drain the pasta and add to the pan. 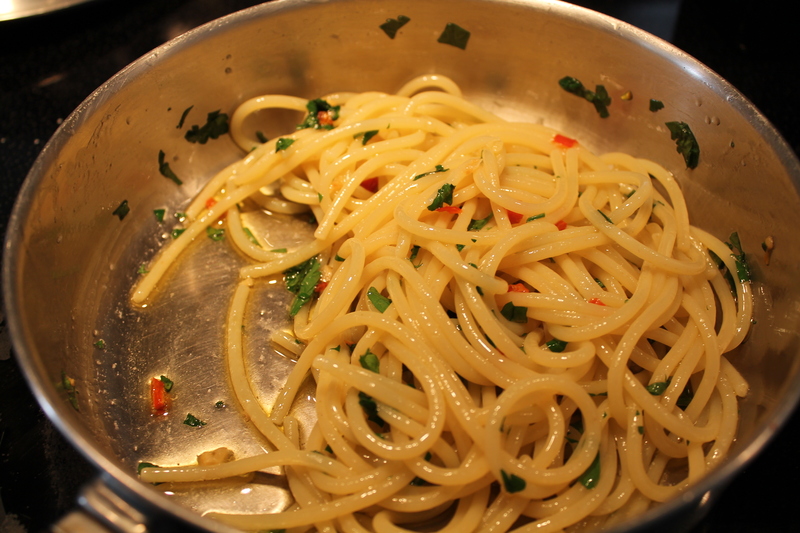 Toss quickly but thoroughly, drizzling with a little extra olive oil if needed, and some freshly chopped parsley. The goal is balance and moderation.